Many causes of incidental focal uptake on raw data images using myocardial perfusion imaging, including malignant diseases, metastatic processes, benign pathologies, and physiological conditions, have been reported in the literature. However, iatrogenic 99mTc sestamibi emboli have not yet been reported. Herein, we demonstrated iatrogenic 99mTc sestamibi embolization on consecutive rest and stressed myocardial perfusion images at different locations. A 53-year-old male patient with hypertension and diabetes had a 15-day history of chest pain and was referred for myocardial perfusion scintigraphy. According to our department protocol, 1-day rest and stress myocardial integrated single-photon emission computed tomography/computed tomography (SPECT/CT) images were acquired. Rest SPECT/CT images obtained 60 min after injection of 10.7 mCi (395.9 MBq) of 99m Tc sestamibi revealed a normal myocardial perfusion with a focal uptake at the left hemithorax [Figure 1]a. This uptake was paired with focal 99m Tc-sestamibi accumulation in the anterior segment of the left upper lobe on SPECT/CT images with no pathologic pulmonary findings in the corresponding low-dose CT images [Figure 1]b. After rest imaging, the patient underwent a standard adenosine stress test. Subsequently, 140 μg/kg/min of adenosine infusion was administered over 6 min, and 31.1 mCi (1150.7 MBq) of 99m Tc-sestamibi was injected at the 3rd min. Stress SPECT/CT myocardial perfusion images acquired 30 min after the pharmacological stress test revealed no sign of hypoperfusion or perfusion defects similar to those in the rest images. However, a focal 99m Tc-sestamibi uptake was observed at the right hemithorax on stress raw data images, and the focal activity accumulation in the left lung, which was detected on the rest images, disappeared [Figure 1]c. Stress SPECT/CT images demonstrated focal increased uptake of 99m Tc-sestamibi in the lateral segment of the right middle lobe without any pulmonary pathology on the reciprocal low-dose CT images [Figure 1]d. These aforementioned incidental focal 99m Tc-sestamibi accumulations in both lungs were evaluated as iatrogenic 99m Tc-sestamibi embolism due to the absence of accompanying pulmonary anomalies in the corresponding low-dose CT images and the disappearance and appearance of focal 99m Tc-sestamibi uptake on the consecutive rest and stress images. Information collected from raw data images is very important for detecting extracardiac findings using myocardial perfusion scintigraphy. Although many causes of incidental focal uptake on raw data images in myocardial perfusion imaging, including malignant diseases, metastatic processes, benign pathologies, and physiological conditions, have been reported in the literature,,,,,,,,,,,, to the best of our knowledge, this report is the first to demonstrate iatrogenic 99m Tc-sestamibi embolization on rest and stress myocardial perfusion images at different locations. In our case, SPECT/CT helped to avoid additional diagnostic tests and radiation exposure and provided psychological comfort to the patient by identifying the false-positive result. For this reason, apart from its significant role in reducing attenuation artifacts and improving image quality, SPECT/CT may alter the approach for patients with extracardiac findings detected using myocardial perfusion imaging. Gedik GK, Ergün EL, Aslan M, Caner B. Unusual extracardiac findings detected on myocardial perfusion single photon emission computed tomography studies with tc-99m sestamibi. Clin Nucl Med 2007;32:920-6. Chamarthy M, Travin MI. Altered biodistribution and incidental findings on myocardial perfusion imaging. Semin Nucl Med 2010;40:257-70. Kim SM, Bom HS, Song HC, Jeong HJ, Min JJ, Li MH, et al. Focal pulmonary uptake during tc-99m myocardial perfusion SPECT imaging. Clin Nucl Med 2001;26:913-5. Williams KA, Hill KA, Sheridan CM. Noncardiac findings on dual-isotope myocardial perfusion SPECT. J Nucl Cardiol 2003;10:395-402. Gowda A, Pirastehfar MH, Chhabra A, Mahmoodi M, Jain D. Abnormal focal pulmonary tracer uptake on myocardial perfusion imaging studies. J Nucl Cardiol 2006;13:e17-20. Reyhan M, Aydin M, Yapar AF, Bolat FA, Tercan F. Atypical carcinoid tumor detected incidentally on ttc-99m sestamibi myocardial perfusion scintigraphy. Clin Nucl Med 2004;29:129-31. Jones SE, Aziz K, Yasuda T, Gewirtz H, Scott JA. Importance of systematic review of rotating projection images from tc99m-sestamibi cardiac perfusion imaging for noncardiac findings. Nucl Med Commun 2008;29:607-13. Malik D, Sood A, Parmar M, Sood A, Radotra B, Mittal B, et al. 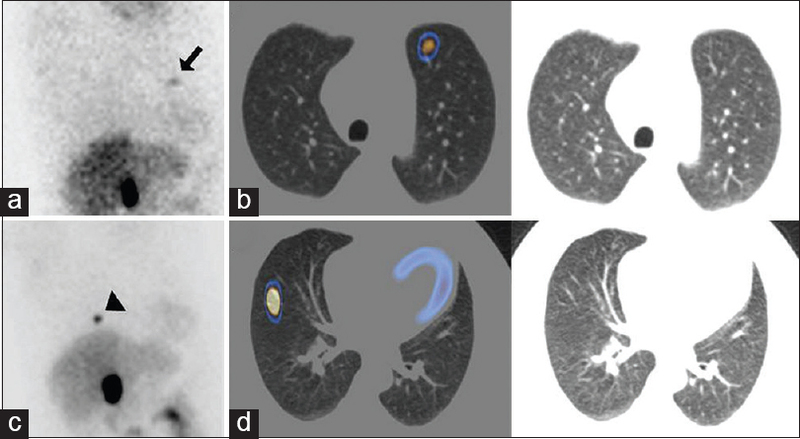 Incidental detection of bronchial carcinoid on tc-99m sestamibi SPECT/CT myocardial perfusion scintigraphy. J Nucl Cardiol 2017;24:319-22. Wittram C, Jones SE, Scott JA 99mTc sestamibi uptake by acute pulmonary embolism. AJR Am J Roentgenol 2006;187:1611-3. Aras T, Ergün EL, Bozkurt MF. Gamut: Visualization of the pulmonary artery on 99mTc-MIBI myocardial perfusion scintigraphy: A cause for focal uptake in the lung. Semin Nucl Med 2003;33:338-41. Aras M, Erdil TY, Ones T, Dede F, Turoglu HT. (99m)Tc-MIBI emboli in the lungs detected on SPECT/CT: A pitfall in parathyroid scan. Clin Nucl Med 2014;39:196-7. Kou Y, Shen G, Ou X, Huang R, Kuang A. Focal pulmonary uptake on 99mTc-sestamibi parathyroid scintigraphy due to iatrogenic microembolism. Clin Nucl Med 2018;43:33-5.